OPEX was featured on Discovery Channel’s Innovations TV. Watch the video clip below or read the interview starring Al Stevens, Dave Stevens, Mark Stevens, Jeff Hedges, and iHerb employees. In 1914, Henry Ford's innovative auto assembly method proved an increase in efficiency from 4.3 cars to 20 cars produced for worker for the year. This advancement had a major impact on production, as companies realized that there was a more efficient way to do business. And began developing the technology to accomplish it. 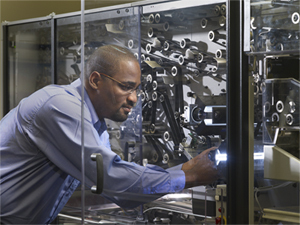 “When you look at the process of automating, there are a lot of factors that improve quality for our customers. And that quality translates into saved dollars. One way that we improve cost for customers is just labor savings itself.” Dave Stevens, President and CEO. One place it benefited enormously from automation is the mail room. For much of the 20th century, rapidly growing volumes of mail were opened and sorted by hand. 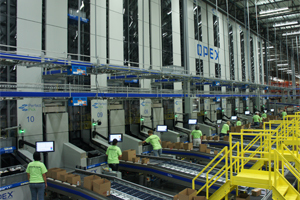 OPEX Corporation, a privately held, family owned company, headquartered in Moorestown, New Jersey, is recognized as a global technology leader in high speed mailroom automation, document imaging, and more recently, warehouse automation. 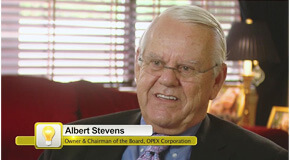 Al Stevens, Chairman of the Board, reflects on his initial connection to OPEX: “In the beginning, my business career started at Columbia Records and it was Columbia House that was a large mail order operation. I had over 200 employees who did nothing but open mail. I was eager to find a company that was going to work on automation in the mail room. OPEX announced that they were doing such a study and that they were developing a piece of equipment. And so, I contacted them and found that, yes indeed, they were developing a machine that was going to run 4,000 or 5,000 an hour and take envelopes of different sizes, open them up, and present them to an operator so that they could work more efficiently. Today, every major credit card company, as well as hundreds of other leading financial processing centers around the world, have chosen OPEX to handle their incoming mail and remittance transactions. OPEX serves thousands of organizations in the financial services, insurance, health care, government, nonprofit, utility, telecommunications, and educational marketplaces. Billions of transactions are processed every year in these industries using innovative technologies designed and manufactured by OPEX. OPEX has also developed an impressive line of proprietary scanning workstations that excel at handling the most difficult document imaging applications. In the 1990s, OPEX experienced the largest growth surge in its history. As OPEX's influence in the global marketplace continued to escalate, the company made a strategic decision to leverage its technology and 40 year history of providing innovative process improvements and enter the warehouse automation market. iHerb, an online retailer that carries one of the largest selections of high quality nutritional products in the world, recently installed a 10 aisle Perfect Pick system to support their rapidly expanding e-commerce business.